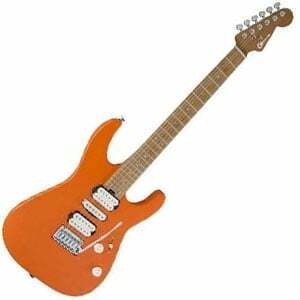 Since the 1980s, the Californian brand Charvel has been associated with high-speed shredders from EVH to George Lynch. More than 30 years on and the company is still going very strongly – and it’s no surprise when you see some of the models in their catalog. Revealed at Summer NAAM 2018, the Pro-Mod DK24 HSH 2PT CM shows off some pretty high-end features, although remains affordable enough to make it onto our chart of the best sub-$1,000 guitars. Today, we’re taking a closer look! On first glance, this Pro-Mod DK24 is a very simple guitar, but on closer inspection you can see it is it is knocking at the door of premium. The solid alder body features a Dinky-style double-cutaway shape with two awesome paintjobs to choose from, both satin-finished – there’s an understated Army Drab along with a Crushed Orange that looks good enough to eat! Bolted onto this body is a very notable two-piece neck made from a dark caramelized maple, with a silky-smooth hand-rubbed finish. This is also true of the caramelized maple fretboard, which features 24 jumbo frets, pearloid inlays, and florescent Luminlay side dots, which kindly glow in the dark (great for stage performing). With a 25.5” scale length, rolled fretboard edges, and a 12” to 16” compound-radius, it’s built for speed players and is ultimately great fun to play. The look is finished off with that classic Strat-style headstock. Made in Mexico, great attention has been paid to the fit and finish of this instrument, while the setup is decent, although would benefit from a little attention on arrival. It has looks that could kill – what about the hardware? As the ‘HSH’ in the name suggests, this axe is loaded with two humbuckers, with a Seymour Duncan Full Shred SH-10B at the bridge and a Seymour Duncan Alnico II Pro APH-1N at the neck. These are separated by another SD pickup; the Custom Flat Strat SSL-6 single-coil in the middle position. Quite a lineup of high-power passive pups there! These are tended to by very simple controls – just a master no-load tone control and master volume knob, both parchment Strat-style skirt knobs, with 500K EVH Bourns low-friction potentiometer. You’ll also find a five-way pickup selector switch. The rest of the hardware is just as good for the price, with a Gotoh Custom 510 floating tremolo bridge, which a very smooth and sturdy system. There’s no accompanying locking nut (it’s a simple GraphTech TUSQ nut), but Charvel’s own diecast tuners do lock for that extra stability. All in all, it’s hard to fault. The only crying shame is the lack of a gig bag, which is to be expected at this price. Not enough to put us off though. With solid pickups from Seymour Duncan, there’s no criticism when it comes to the sound – this is as high-end as it gets for under $1,000. The Full Shred at the bridge is clean and focused, with a tight bass and balanced treble – a shredder’s best pal. The neck humbucker is warmer and great for everything from blues to modern metal, while the overwound Custom Flat Strat single-coil has a solid Strat-style sparkle, but with a bit more beef. Ultimately, it’s a very versatile trio, working well for rhythm but truly happy in the hands of an enthused lead guitarist. There’s no hiding the fact that we are impressed with this new midrange offering from Charvel’s Pro-Mod Series – it rocks. The sound is alone worthy of picking up this guitar, yet the paintwork, neck and extra details will have you sticking around for a long time to come! For more info about the Charvel Pro-Mod DK24 HSH 2PT CM, click here.